Democrat Ronnie Mabra is facing questions about his eligibility to seek and hold the office of state Representative from the 63rd district. In a residency challenge filed June 6th with the Secretary of State, Linda Pritchett says she believes Mabra "does not live anywhere in State House District 63." The challenge, which is pictured right, goes on to say "The address that Ronnie Mabra is using may have been a previous address of his family's. However that home [...] was foreclosed on June 3, 2008. A search of records maintained by the Clerk of Fayette County Superior Court shows that a person bearing the name Ronald E. Mabra had property foreclosed upon by RBC Bank USA [Fayette County Clerk of Superior Court Deed Book 3409, Page 742-745]. The property, carrying the parcel number 0546-054, has seen liens and FIFAs filed against it since Ronald E. Mabra, Sr. (he is the father of Ronnie, Jr.) first purchased the property in 1986. 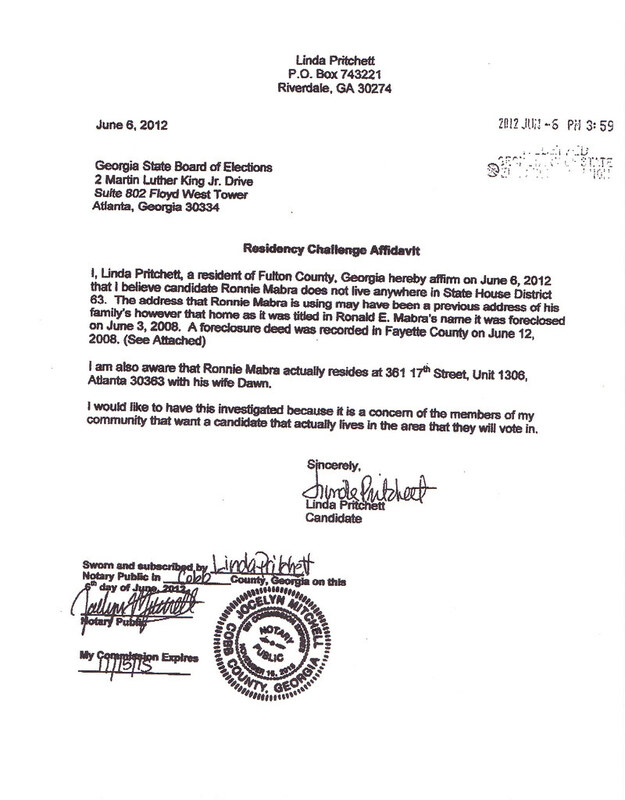 Pritchett, herself a candidate for state House district 63, also says she is "aware that Ronnie Mabra actually resides at 361 17th Street, Unit 1306, Atlanta, 30363 with his wife Dawn." The Constitution of the State of Georgia and the Official Code of Georgia Annotated require that members of the General Assembly must live in the district they represent for at least one year before being elected to the office.